Cyclists often take their bikes to professionals for maintenance and repair, trusting that the bike shop and mechanic will do quality work. However, in some cases the attorneys at The Law Offices of Frank L. Branson discover that serious and fatal bicycle accidents are caused by negligent bike maintenance. Bikes require routine and proper maintenance to ensure that wheels, brakes, gears, shifters and other parts are working properly. 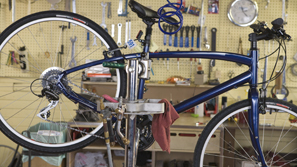 When a bike shop or mechanic improperly repairs a bicycle, accidents can cause traumatic head injuries, brain and spinal cord damage, broken bones, road rash, death and more. The experienced lawyers at The Law Offices of Frank L. Branson will determine if a bike accident was caused by the negligent maintenance and repair of the bike, and then work to hold the bike shop or mechanic accountable. To learn more about our experience in negligent bicycle maintenance matters, we invite you to contact the firm here.